We’d love your help. 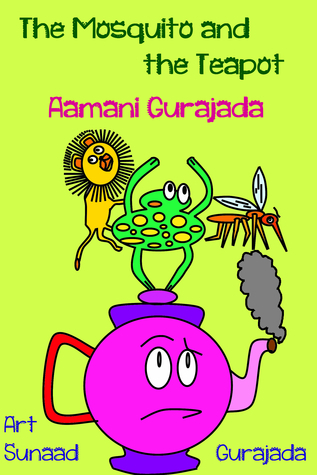 Let us know what’s wrong with this preview of The mosquito and the teapot by Aamani Gurajada. To ask other readers questions about The mosquito and the teapot, please sign up. This is a biased rating because the author (6 years) and illustrator (11 years) are my children! "The Mosquito and the Teapot" by Aamani Gurajada is an astonishing short book written and illustrated by two very young and very talented artists. The simplicity of their form is disarming and there is a potentially very wise head behind the writing. The author seems to long for peace and resolve, which makes this a positive, upbeat and happy read. Like the lion and the "The Mosquito and the Teapot" by Aamani Gurajada is an astonishing short book written and illustrated by two very young and very talented artists. If you want a moment of happiness - want desperately to believe that all will be right in the end, however bad the world is now; if you want reason to hope that everyone will find a way to live happily ever after, please buy this book! The author, Aamani, gives you hope - her optimistic little stories all start off with trouble and end happily. She, and the fabulous artist, Sunaad, will make you smile, and think, and smile some more, because you know what's coming next - world peace! Really - Aam If you want a moment of happiness - want desperately to believe that all will be right in the end, however bad the world is now; if you want reason to hope that everyone will find a way to live happily ever after, please buy this book! The author, Aamani, gives you hope - her optimistic little stories all start off with trouble and end happily. She, and the fabulous artist, Sunaad, will make you smile, and think, and smile some more, because you know what's coming next - world peace! Really - Aamani, with her very simple, pragmatic solutions, should rule the world! Got a copy of this book to review, well my two young daughters did actually..they loved the simple stories, worded for a child from a child..my 7 yr old daughter lily has a form of autism and she adored the pictures and laughed a lot as her 4 yr old sister read them to her along with me..all in all we loved the book thank you!!!! This young author has a wonderful way of making her point. Each short story beats the crap out of Aesop's. It's clear that she has a deep sense of right and wrong, and easily conveys that to the reader. The illustrator depicts the emotion in each scene perfectly, making it a fun read. There is much to learn from this youth. This is amazing and very colorful and the children that wrote it and did the drawings...WOW.....this is a great book for a child and my oldest granddaughter could read it with no problem to her sister. This is a must have for kids. Great Art.Very Colorful,Easy to read and understand. I loved this book. It was so cute. It made me smile and remember when my kids would spin tales likes the ones in the book, and sometimes they still do. The illustrations were perfect. Great job to the young author and illustrator. My favorite story was the first one, The Lion cub and the Tiger cub. This book is pure innocence and evokes the same emotion in you irrespective of your age. Aamani shows how easily one can retain friendships! The illustrations do justice to the text. I am looking forward to reading more books from this talented team. What a delight! The front cover says it all...A cast of colorful, animated characters. Dashing stories with sweet lessons to be learned. Stunning art work and vibrant colors. This little gem will keep any child, or adult reading The Mosquito and the Teapot over and over again. It did me! I won this e-book on booklikes.com in a giveaway. The author is 6 years old and the illustrator is 11 years old. Amazing. This is a children's book. The book has 7 short stories. The most interesting thing is this young author understands a lot about the dynamics of friendship. Her short stories reflect one object in some cases or an animal in other cases needing a counterpart to make sense of things. Each story was a little surprise and I loved it. I hope Aamani continues to write because if she I won this e-book on booklikes.com in a giveaway. I hope Aamani continues to write because if she is this good now, she may be a great author of novels one day. Recommended reading for ages 4-6 years old. Author, Aamani Gurajada, who is but 6 years old, compiles an adorable collection of stories that deal with friendships and what it takes to maintain them. The stories are all cute though my favorite is the one that relates the tale of a friendship between a lion cub and tiger cub that is threatened when each of the cubs insists on being right in an argument. I would recommend the purchase of the book for its content as it is an enjoyable read with a message. I would urge you even more to acquire Author, Aamani Gurajada, who is but 6 years old, compiles an adorable collection of stories that deal with friendships and what it takes to maintain them. The stories are all cute though my favorite is the one that relates the tale of a friendship between a lion cub and tiger cub that is threatened when each of the cubs insists on being right in an argument. I would recommend the purchase of the book for its content as it is an enjoyable read with a message. I would urge you even more to acquire the book for your kids so that they can be inspired by children who pluckily express their creativity.